This is the PDF version of this publication, available for purchase as a download only. File size of this document is 5.3MB. 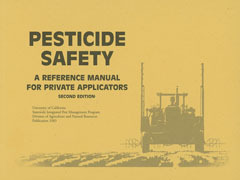 This manual covers information essential for anyone using pesticides on California farms, including growers, managers and employees in an easy-to-use format, with many illustrations. An appendix includes sample training forms for pesticide handlers and fieldworkers This is a great resource for private applicator certification with review questions in each chapter. This version of the publication is available for purchase as a download only, and requires the free Adobe® Acrobat® Reader. You can download a free copy of the Acrobat Reader from Adobe Systems Incorporated.